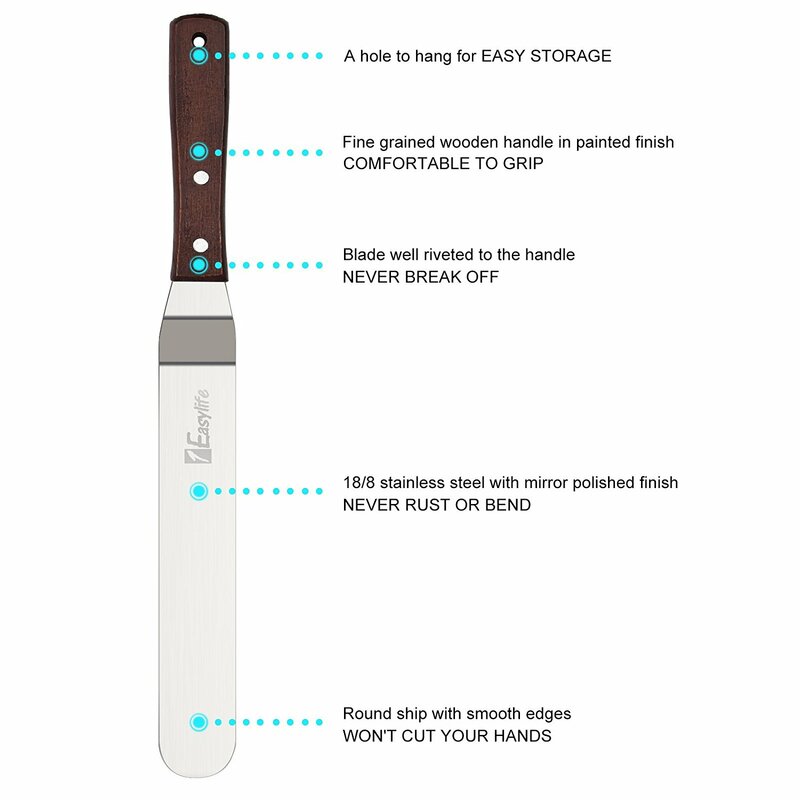 √ FINE GRAINED WOODEN HANDLE: ★The handle is made from beautiful fine grained wood in a painted finish, and won’t rot. A nice solid weight makes it comfortable to grip. Plus, there is a hole on each handle, which is convenient to hang, and save space. BPA FREE. 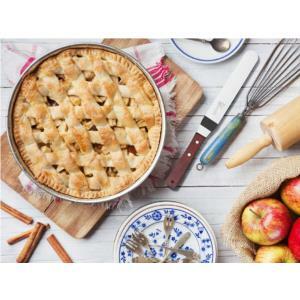 √ ANGLED QUALITY STAINLESS STEEL BLADE: ★Angled blade makes it super easy to ice or top a dessert in a pan, and more flexible so that you can control them better. 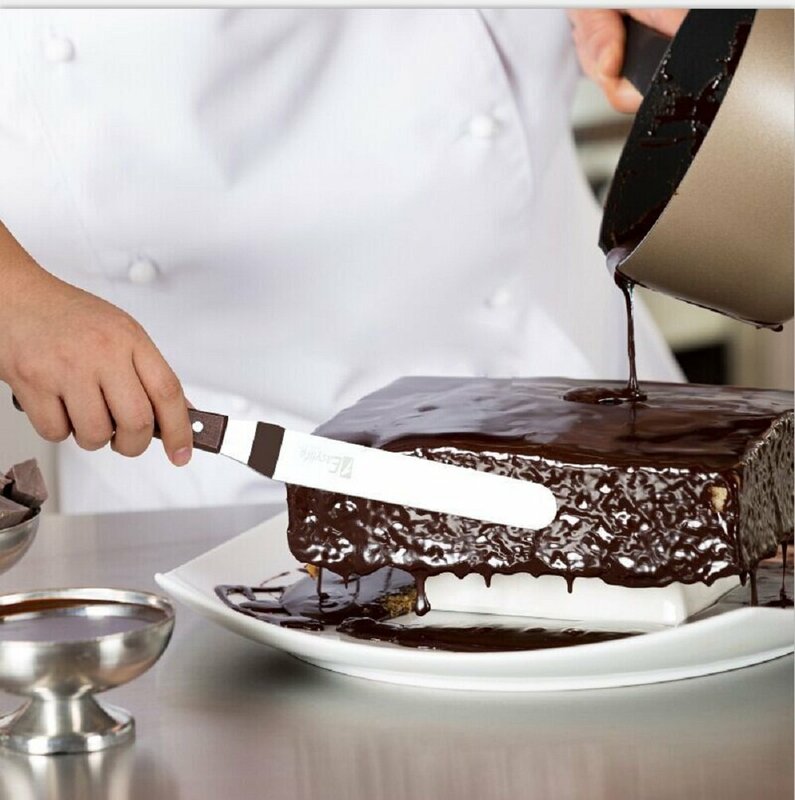 Blade is made with 100% food grade stainless steel, so sturdy and durable, never bend or rust, You Deserve The High-quality Stainless Steel Cake Icing Spatula for Your Baking. Do you still use a butter knife or a straight spatula for spreading frosting on cake? Or didn't you have a large spatula for icing a tier wedding cake ? ☆ Flexible: Compared to the straight spatula, the angled cake icing spatula is a little more flexible so that you can control it better. 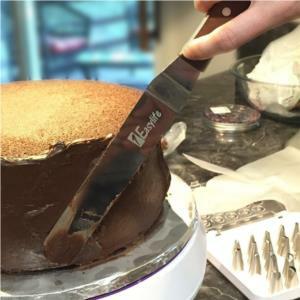 The total length of the visible blade is 8", but how long is the flat part of the blade that actually touches the icing? Perfect as a pizza spatula as well. I decided to order this to use as a pizza spatula.I was immediately how sturdy, well made and a little heavy it is. 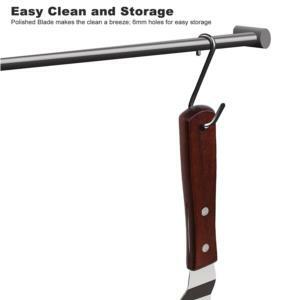 It has a stainless steel blade that is angled which allows for more flexibility.The handle is easy to grip, attractive and made of grained wood. 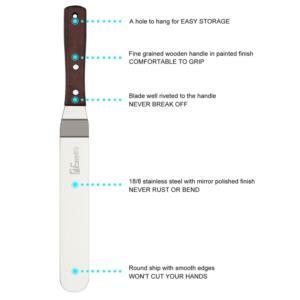 There is also is a hole in the handle which enables it to be hung.This is a versatile piece that be used for several things including icing cakes & as a pizza spatula which I am using it for.This would make a great gift for just about anyone because it is so versatile & has many uses.Overall - I do highly recommend & feel the current price is a total deal & worth the money because it does exactly what it claims to do. I was happy to be chosen to receive this at no cost or a discount in exchange for my honest review.I have included a photo to assist you with your shopping decision.I also rely on others reviews when I purchase items on amazon so I do hope you have found my review helpful* ☺Thank you. 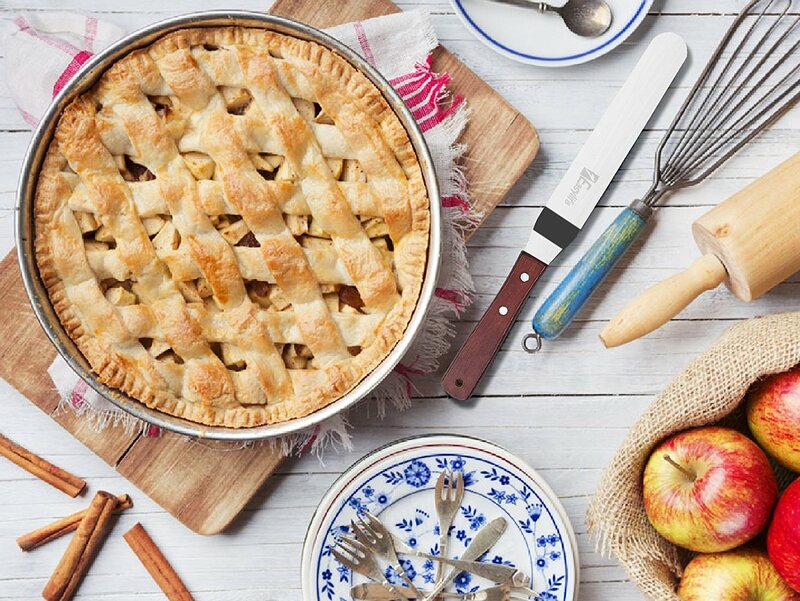 It's perfect, just the right size to frost a cake, either round or oblong. Easy in the hand too and well made. A very good value. I had seen something similar on one of the cooking shows and realized how easy it would make frosting a cake. I look forward to figuring out other ways to use it. I am amature and learning how to bake, just for my family. Last time i tried to bake cake, It turns out ok but i dont have have a spreader and its hard for me to spread the ganache, i used one of my kitchen tools.Glad i found this, it can help me frost myu cupcakes and cakes now.This spreader is nice. 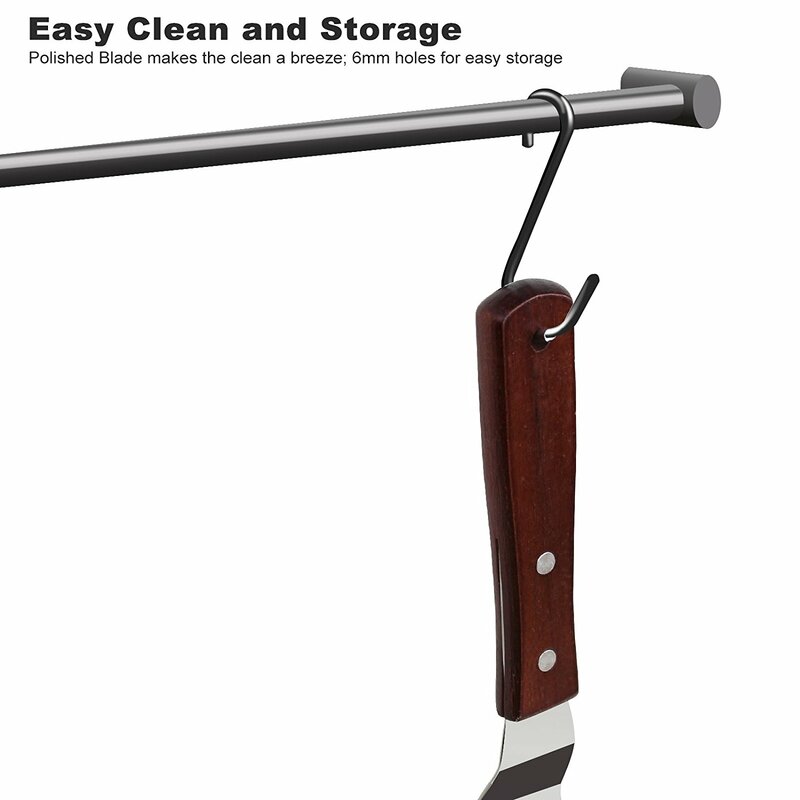 Looks sturdy and durable.Made of high quality product.Blade is made of stainless steel. (8" long) which is pwrfect for spreading ganache and frosting. Descriptions says never bend and rust.handle is made of wood. Easy to hold.Wont rot.BFA free and FDA approved.Overall i like it. This is very helpful for a beginer like me. I dont see any problem on this product. Looks really great.I received this item for free in exchange of my honest and unbiased review. All words above are came from my own experienced on the product and my own opinion. 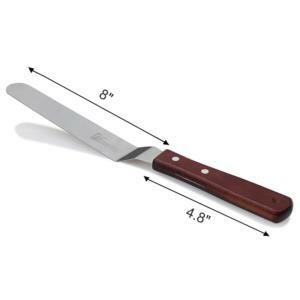 This wooden handled spatula is easy to use and clean.This is a large size spatula with a dark stained handle and lightweight metal smoother. The spatula was easy to use, cleaned with soapy water and remained shiny and did not lose it's finished coating. We purchased this for use in our kitchen for the occasional birthday cake. It was easy to spread the frosting on the cake and et a nice smooth finish. The weight was lighter than I am used to, but it did not compromise the outcome of the cake at all. My daughter was also able to use this and help decorate the cake.This is great spatula for any level of cake decorator.Disclaimer- I received this product free or at a discount for my honest and unbiased review. All opinions are my own. Finally a spatula that lets me get the icing even! My daughter likes to help me in the kitchen, so we tend to bake a lot of goodies. I am pretty decent with a piping bag, but have never been able to ice a cake evenly. It was not until I used this spatula that I realized it wasn’t my technique that was the main problem. The biggest issue was the spatula I used. 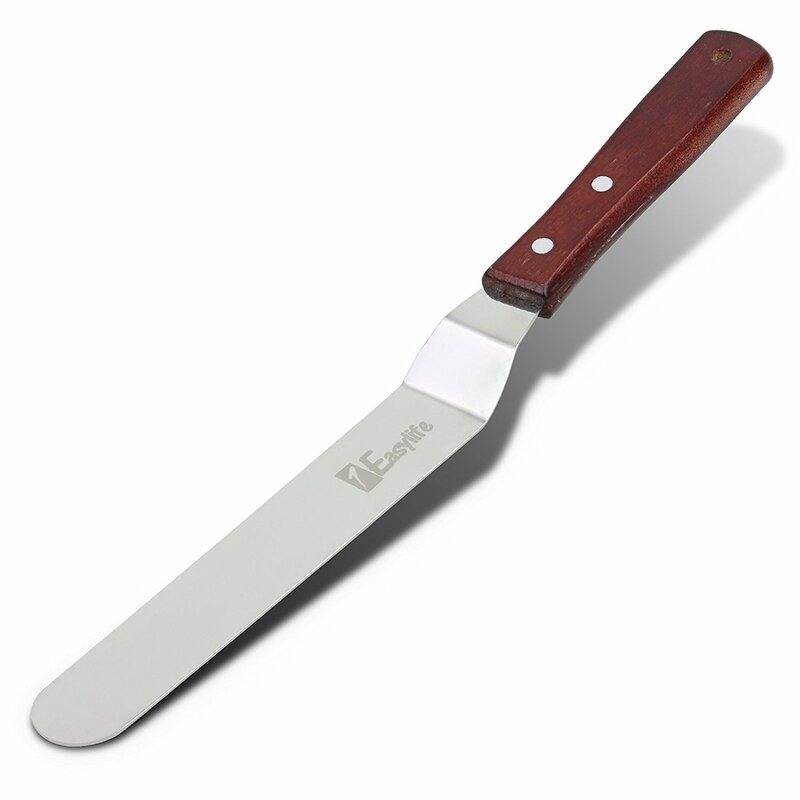 This is a great metal spatula that is longer than any one I had at my home. I love that it is flexible, but it is still strong enough to use when cutting a cate too. It has a nice sturdy handle that is easy to hold without it being awkwardly large. I store it in my drawer, but it could easily be stored in a counter container or hung up. I plan to use this for every cake that I make from this point forward because of how easy it is to spread the icing for a crumb layer or even a smooth iced cake. This is such a great spatula that I would give it as a gift to someone who likes to bake too.This product was provided to me for free for my unbiased and honest review. I personally take reviews into account when considering a purchase and make sure to use each product prior to reviewing it.